Successfully Added Preorder HOMTOM HT20 Waterproof Smartphone - IP68 Waterproof, 720P Display, Android 6.0, Quad-Core CPU, 4G (Green) to your Shopping Cart. This Product is a Pre-Order Product that is expected to be shipped on the 11th of November 2016. Do not order with other products. This is a Pre-Order product and as such the weight, dimensions and specifications of this product could be subject to change. We will update the listing when the product is received in stock. Unlike most rugged phones the HOMTOM HT20 has a slim and appealing look. This Chinese smartphone features an IP68 waterproof design and is extremely durable yet, from the outside, it does not hold the looks of a classic rugged phone. 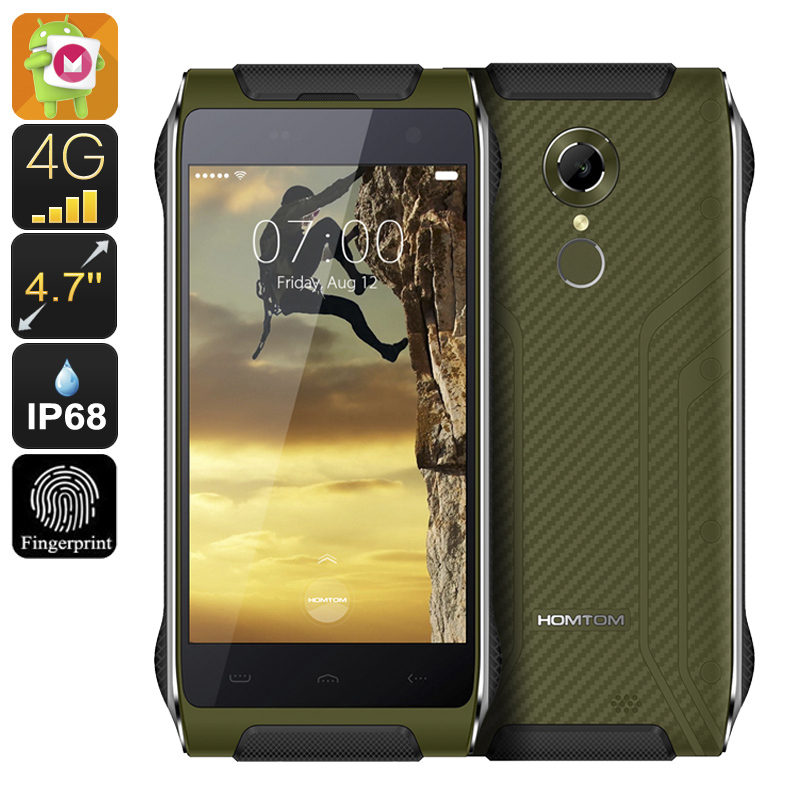 Instead, the designers at HOMTOM have made sure that this Android phone is more appealing to business users by leaving away the usual rubber exterior that can be found on the typical rugged phone, making the HOMTOM HT20 an extremely durable smartphone while, at the same time, keeping a thin, appealing, and sleek design. Keeping this latest smartphone by HOMTOM sleek yet waterproof has been achieved by the use of state of the art vacuum technology through which the device has been hermetically sealed. Thanks to this sealing technique this Chinese smartphone enjoys a sleek yet fully waterproof and dustproof design. The result is a thin and stylish smartphone holding features comparable to that of the toughest rugged phones out there. Featuring an Android 6.0 Operating system the HOMTOM HT20 offers a smooth user experience and provides access to the latest features the mobile industry has to offer. Take its smart wake and gesture sensing features, for example. These features allow you to navigate quick and effortlessly throughout your smartphone, enhancing your user experience and making it a true dream to use. Holding up to two SIM cards and featuring 4G-connectivity you can gain access to the latest and fastest data transfer speeds out there – allowing you to stream movies and download files in the blink of an eye. Its ultra-fast fingerprint scanner additionally allows you to effortlessly access your phone in a fraction of a second without the need to remember those bother access codes or passwords. This android phone comes along with some serious hardware. Holding an MTK6737 Quad-Core CPU and 2GB of RAM this smartphone has all the hardware needed to deal with the most demanding of everyday needs. Along with its Mali-720 GPU this phone lets you smoothly enjoy the latest games and media in stunning quality on its 720p HD display. The HOMTOM HT20 Android Smartphone comes with a 12 months warranty, brought to you by the leader in electronic devices as well as wholesale android phones..